Add all ingredients into a blender and blend until there is a smooth consistency. 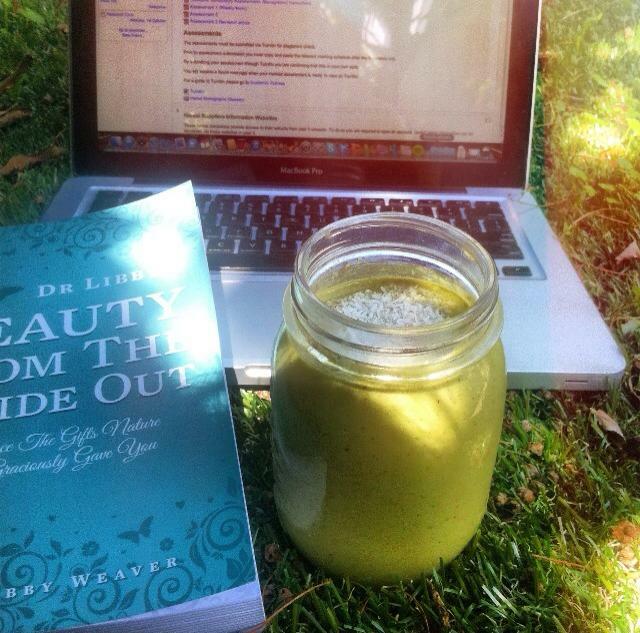 This green smoothie contains three of my favorite high quality fats which are Avocado, Coconut Oil and Peanut Butter. Fat is one of the three basic macronutrients (proteins, fats, carbohydrates) that your body needs to survive. It has many special roles from providing superior long lasting energy to supporting the development of hormones. Fat is needed for protecting vital organs, it’s also required for assimilating the fat-soluble vitamins A, D, E, and K.
Your cell membranes are made from fat. The right balance of healthy fat allows your body to create strong but flexible cell membranes that can receive nutrients and excrete wastes efficiently. Certain high quality fats are also able to reduce cholesterol levels and aid in detoxification. The avocado gives it a fluffy and creamy texture without having to use any dairy. I sprinkled some desiccated coconut over the top of the smoothie. For more delicious Avocado recipes check out the NZ Avocado website!